As they marched through Mexico, they received help from sympathetic Mexicans who offered food, water and clothing. 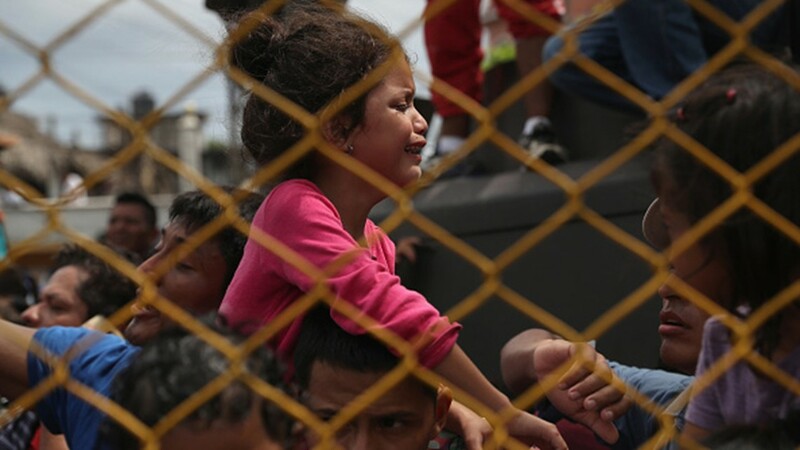 Family members of the migrant caravan are pushed forward at a gate separating Guatemala from Mexico on October 19, 2018 in Ciudad Tecun Uman, Guatemala. 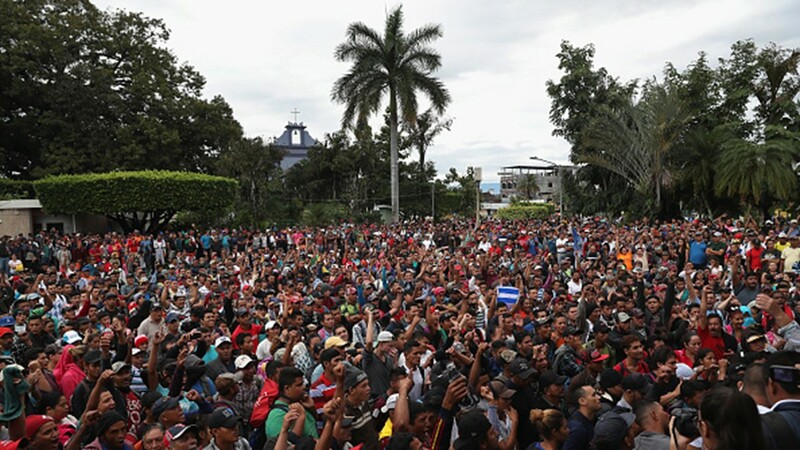 Members of an immigrant caravan gather before attempting to cross the Guatemalan border into Mexico on October 19, 2018 in Tecun Uman, Guatemala. 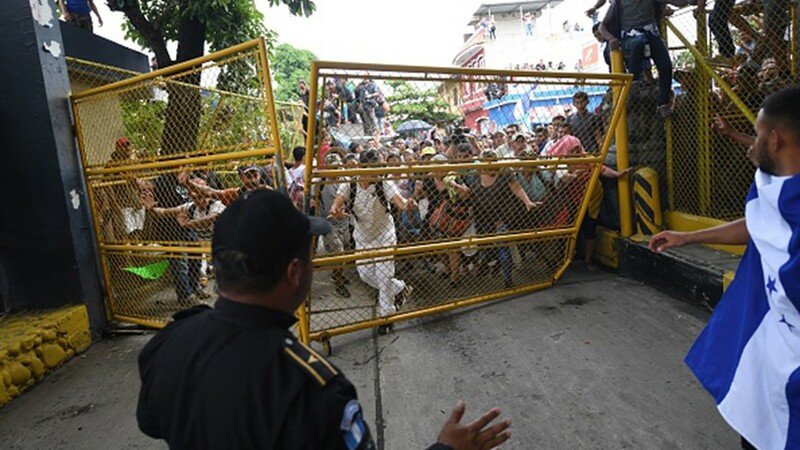 Honduran migrants heading in a caravan to the US push to tear down the gate of the Guatemala-Mexico international border bridge in Ciudad Hidalgo, Chiapas state, Mexico, on October 19, 2018. 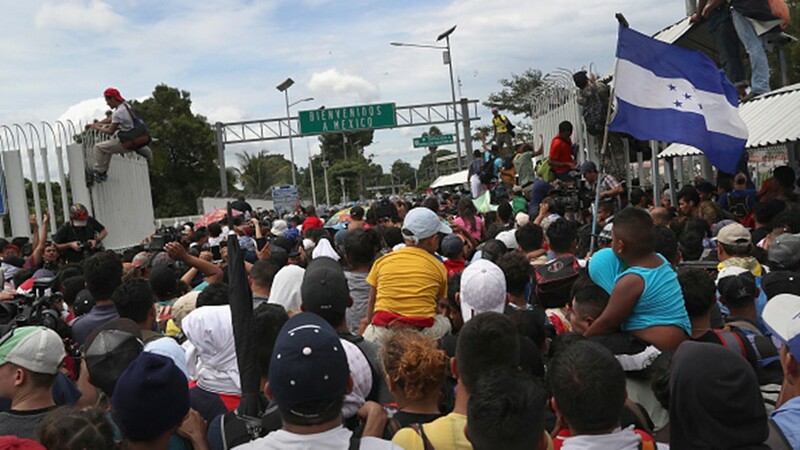 Honduran migrants heading in a caravan to the US, gather behind the gate of the Guatemala-Mexico international border bridge in Ciudad Hidalgo, Chiapas state, Mexico, on October 19, 2018. 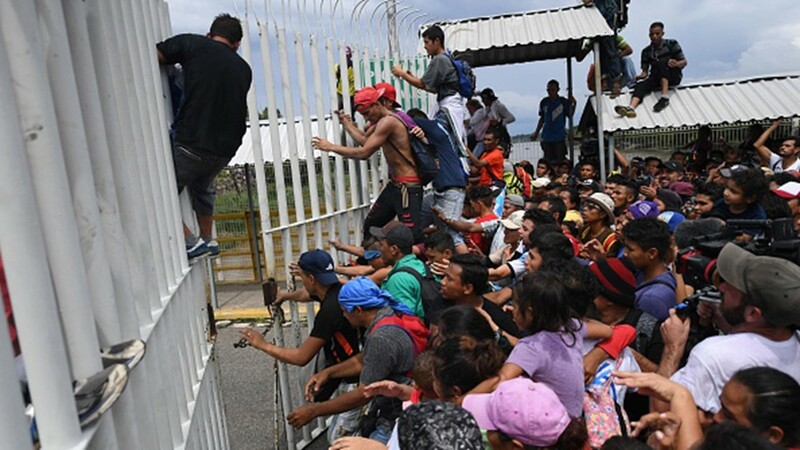 Honduran migrants heading in a caravan to the US, climb the gate of the Guatemala-Mexico international border bridge in Ciudad Hidalgo, Chiapas state, Mexico, on October 19, 2018. 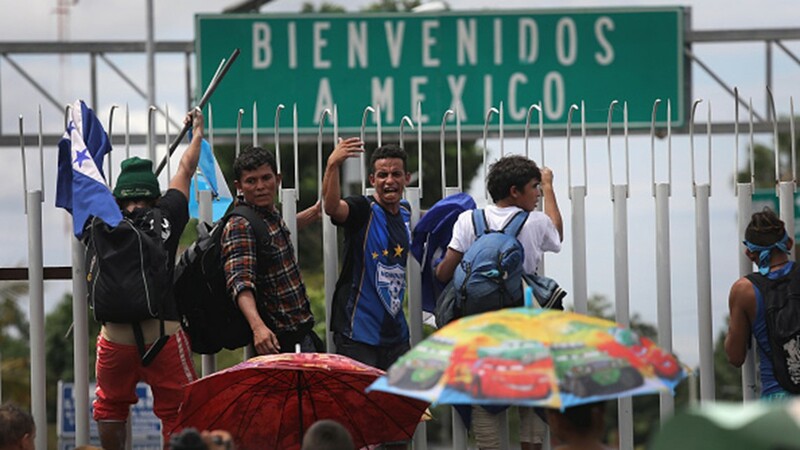 Honduran migrants heading in a caravan to the US climb the gate of the Guatemala-Mexico international border bridge in Ciudad Hidalgo, Chiapas state, Mexico, on October 19, 2018. 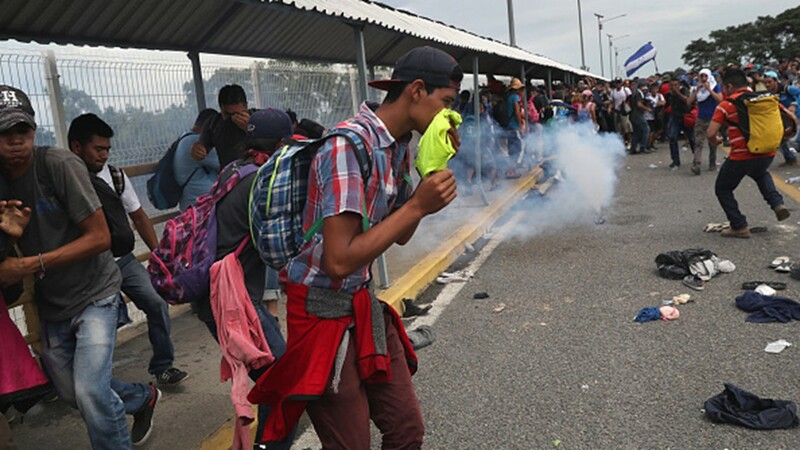 Members of the migrant caravan run from tear gas fired by Mexican riot police on the border between Mexico and Guatemala on October 19, 2018 in Ciudad Tecun Uman, Guatemala. 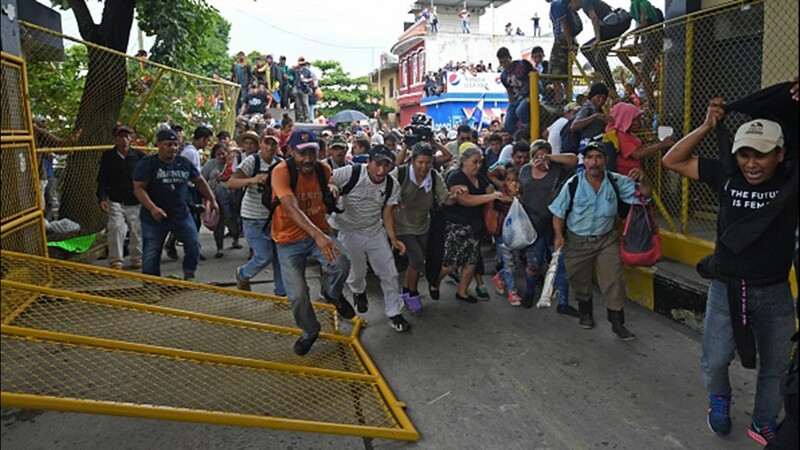 Honduran migrants heading in a caravan to the US rush through the Guatemala-Mexico international border bridge after tearing down its gate in Ciudad Hidalgo, Chiapas state, Mexico, on October 19, 2018. 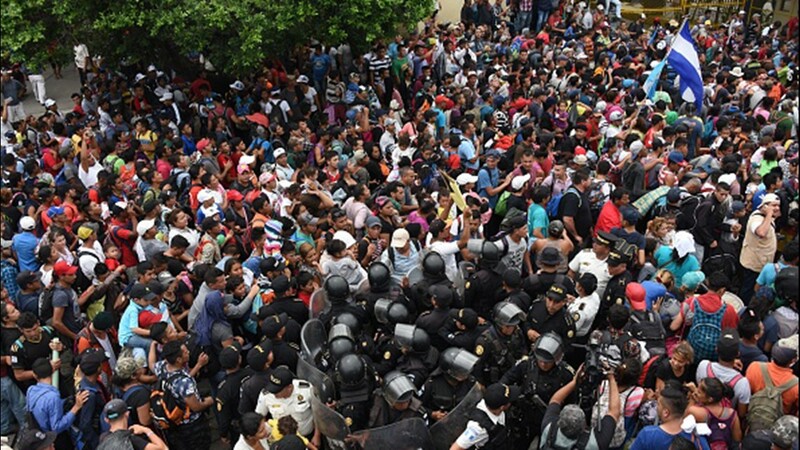 Guatemalan security forces try to prevent Honduran migrants from reaching the Guatemala-Mexico international border bridge in Ciudad Tecun Uman, Guatemala, on October 19, 2018. 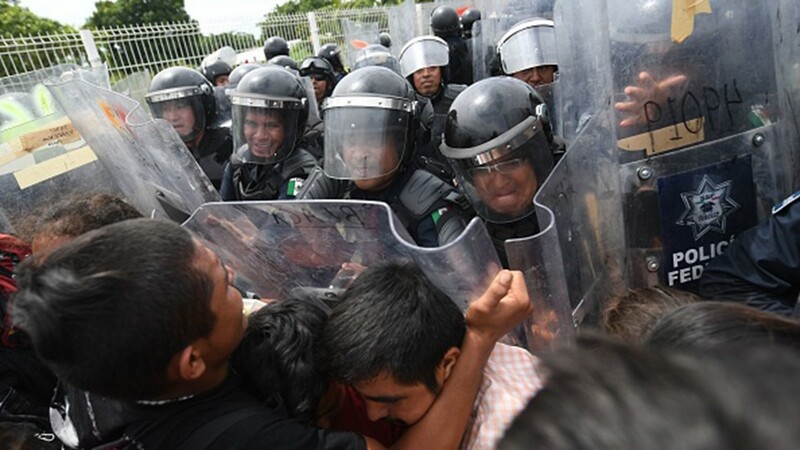 Mexicna Federal Police officers try to prevent Honduran migrants, heading in a caravan to the US, from going through at the Guatemala-Mexico international border bridge in Ciudad Hidalgo, Chiapas state, Mexico, on October 19, 2018. 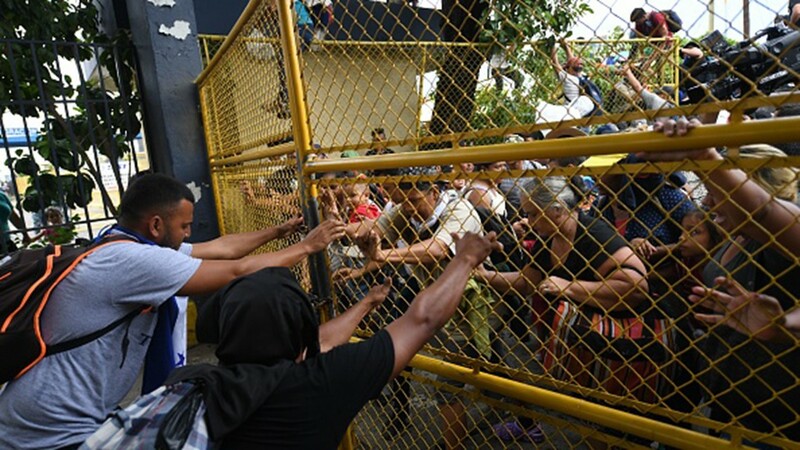 Honduran migrants heading in a caravan to the US, remove a barrier at the Guatemala-Mexico international border bridge in Ciudad Hidalgo, Chiapas state, Mexico, on October 19, 2018. 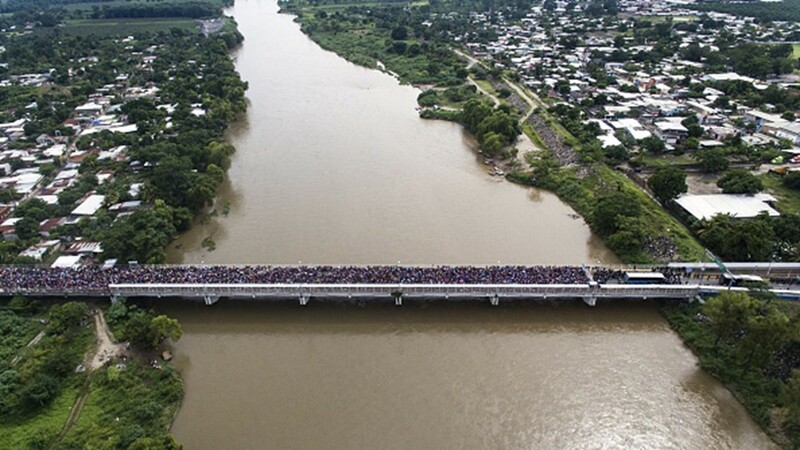 Aerial view of a Honduran migrant caravan heading to the US, as it is stopped at a border barrier on the Guatemala-Mexico international bridge in Ciudad Hidalgo, Chiapas state, Mexico, on October 19, 2018. 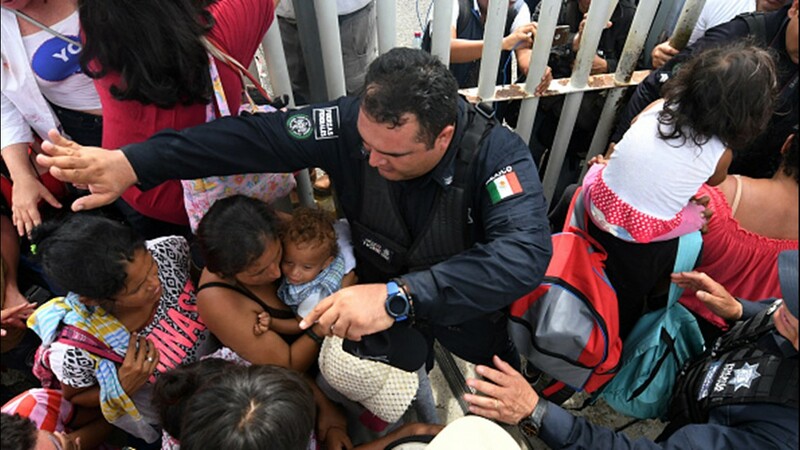 Mexican federal police officers allow women and children, taking part in a caravan of Honduran migrants heading to the US, to cross to Mexico in the border city of Tecun Uman, 257 kilometers south of Guatemala City, on October 19, 2018. 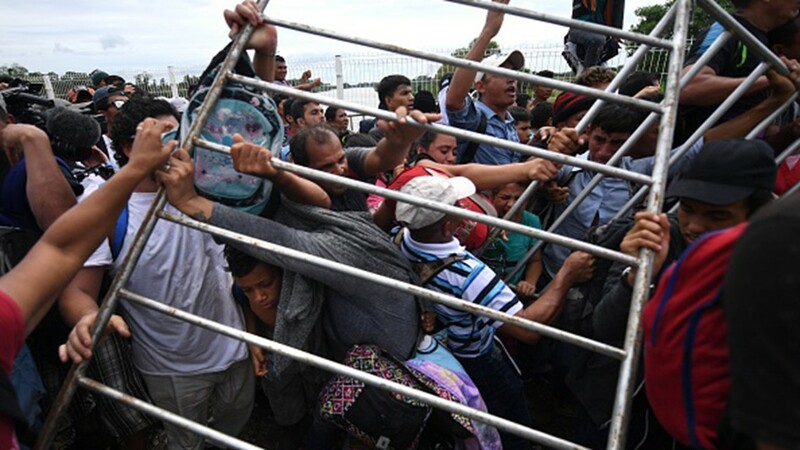 Honduran migrants heading in a caravan to de US, jump from the Guatemala-Mexico international border bridge to the Suchiate river, to swim or board a raft to reach Mexico in Ciudad Hidalgo, Chiapas state, Mexico, on October 19, 2018. 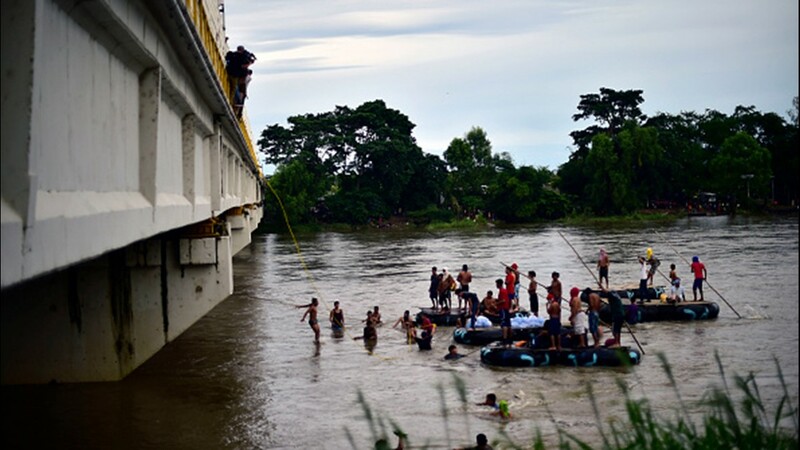 A Honduran migrant heading in a caravan to de US, jumps from the Guatemala-Mexico international border bridge into the Suchiate river, to swim or board a raft and reach Mexico in Ciudad Hidalgo, Chiapas state, Mexico, on October 19, 2018. 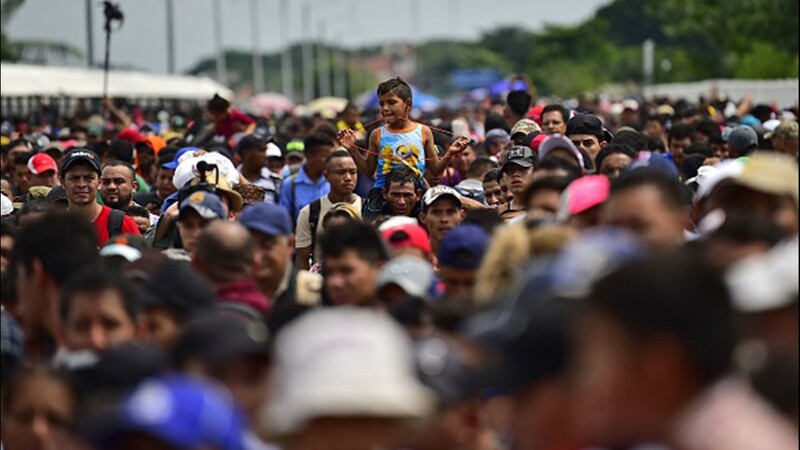 Honduran migrants heading in a caravan to the US, try to reach Mexico through the Suchiate River, in the border city of Tecun Uman, Guatemala, on October 19, 2018. 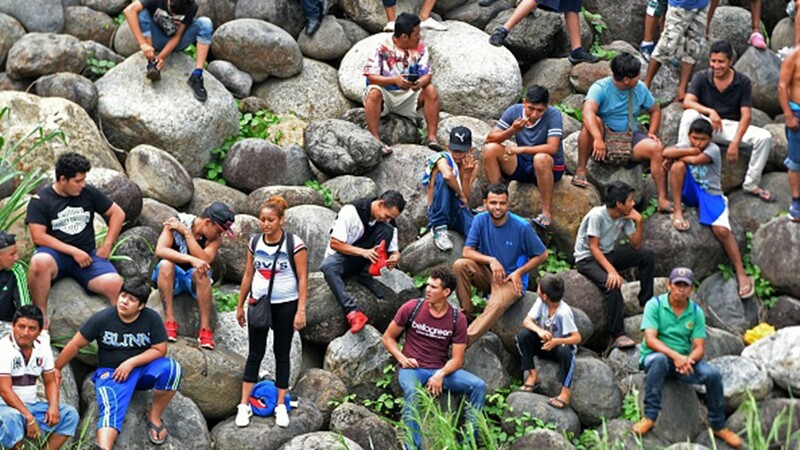 Honduran migrants heading in a caravan to the US, rest after swimming from Guatemala across the Suchiate River to reach the border city of Ciudad Hidalgo in Mexico, on October 19, 2018. 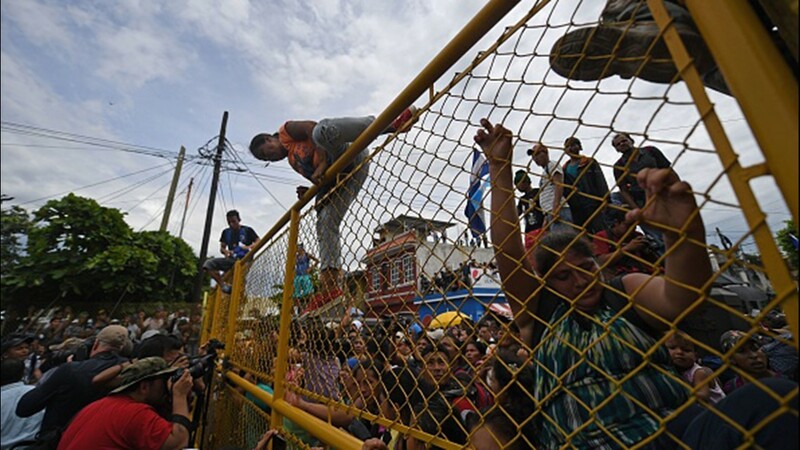 Members of the migrant caravan climb atop a gate during a clash with Mexican riot police on the border between Mexico and Guatemala on October 19, 2018 in Ciudad Tecun Uman, Guatemala. 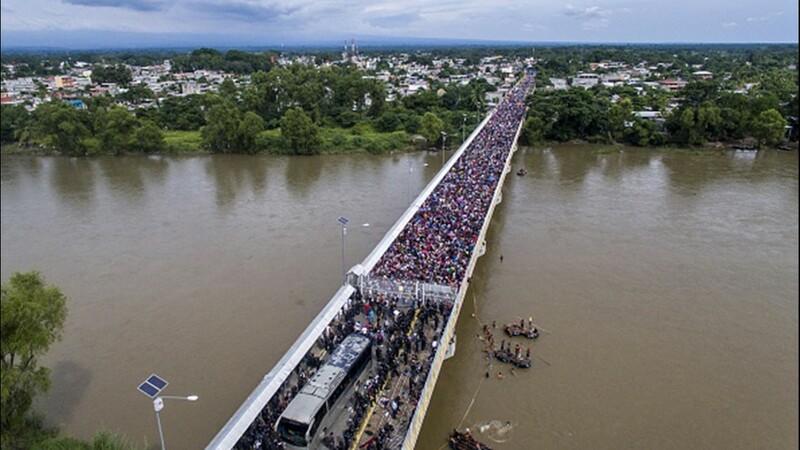 Members of the migrant caravan walk over a border bridge between Mexico and Guatemala on October 19, 2018 in Ciudad Tecun Uman, Guatemala. 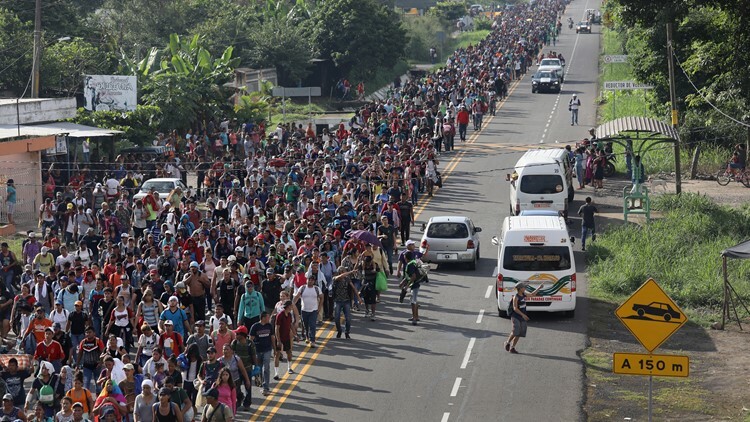 A migrant caravan walks into the interior of Mexico after crossing the Guatemalan border on October 21, 2018 near Ciudad Hidalgo, Mexico.